Servicing the Tampa, Land O' Lakes, and Lutz area. Need a New Lawn Maintenance Company? 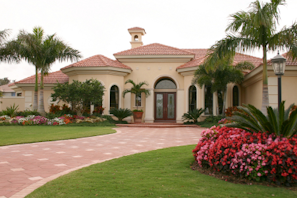 All Nu Landscape and Design is your complete landscaping solution in the Tampa Bay area. I offer an all-in-one solution to all of your landscaping needs. This includes lawn maintenance, irrigation, pest control, tree trimming, fertilization, and more. I have over 15 years worth of experience. AllNu Landscaping and Design, Inc. is licensed and insured. I do all the standard maintenance to insure that you will have a property that you can be proud of. I only use high quality commercial grade equipment to do all the mowing, trimming, and edging. Sprinkler systems need to be checked periodically to maintain efficiency. Leaky valves and broken sprinkler heads can lead to costly water bills. Got St. Augustine grass? Then, you need a good pest control company to manage the problems associated with this turf grass. I work with a pest control company to take care of this for you. Mulch is important to put around your landscape plants. It significantly reduces weed growth, helps to retain soil moisture, and regulates the soil temperature. Plus, a mulched house just looks better! Annuals add instant color to your property. These are not your typical "garden center" flowers. These are grown from a local nursery so that they stay bushier and last longer. And, they come pre-fertilized. Sometimes you just need someone to clean up your property and make it look neat. I can trim up those overgrown shrubs, pull all those weeds out, and make your property look like new again. This is one of the most dangerous plants to have in your yard. Read why. What are the Best Flowers to Plant? There are many different annuals and perennials to choose from. Here are the best performers. Find out the reasons why you should put mulch around your landscape plants. These are the water restrictions for the City of Tampa. These are the water restrictions for Hillsborough County. These are the water restrictions for those living in Pasco County. This is a monthly guide for what to plant and do in your garden. I get some of my plants, mulch, and other landscaping supplies here.